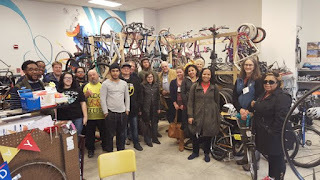 Reading, Pennsylvania has become a new model for Social Bike Business because the entire city, from government officials to citizens, support and are proud of their social bike shop. That bike shop has also led to a bike-share program, a downtown DIY repair station, and bike racks on busses. New bicycle facilities on the streets are in the works. Read about this incredible story in this recent NPR article. This didn’t happen overnight. Reading had to hit some terrible times first, including high unemployment and too many residents below the poverty level. But those bad stats set the stage for what has become a vibrant structure that now cranks out programs, run by locals, that are changing the city into a healthy, safe, and happy place for everyone who lives there. And they started with bikes! In 2013, Reading’s mayor called a summit of officials and community stakeholders to take an honest look at their deteriorating economic situation. They saw the creation of a nonprofit community development corporation (CDC) as key to the solution and guided its founding. That CDC, called ReDesign Reading, is now the powerhouse behind programs that engage citizens in recreating their city – from murals to community gardens and markets to bikes. 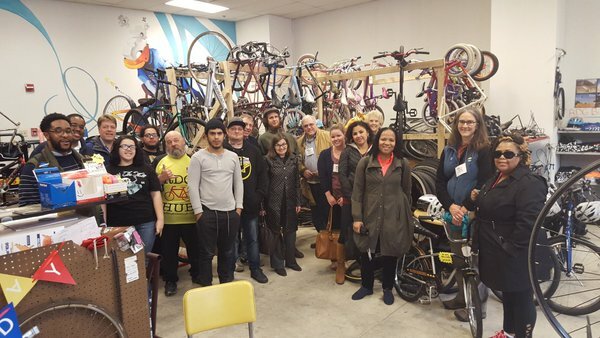 Do you lead a bike program in your city that seems too detached from your city government? Check out ReDesign Reading then show your city officials. They’ll have a hard time snubbing such a fantastic model that sets citizens out as the experts and the very heart of solving a city’s problems. And they’re doing it with bikes!